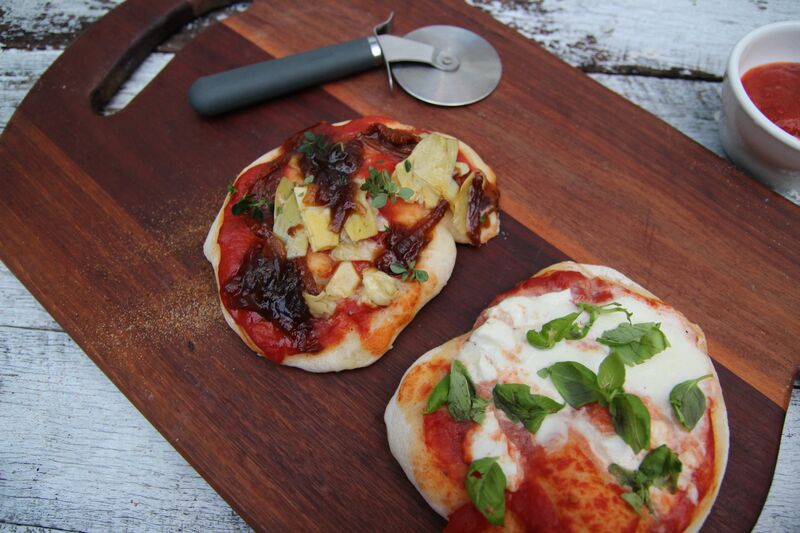 Here’s Jamie Oliver’s simple recipe for pizza dough. I love it and it’s always my go-to recipe when I’m in the pizza making zone! I use my barbecue with a lid and a temperature gauge as the oven. 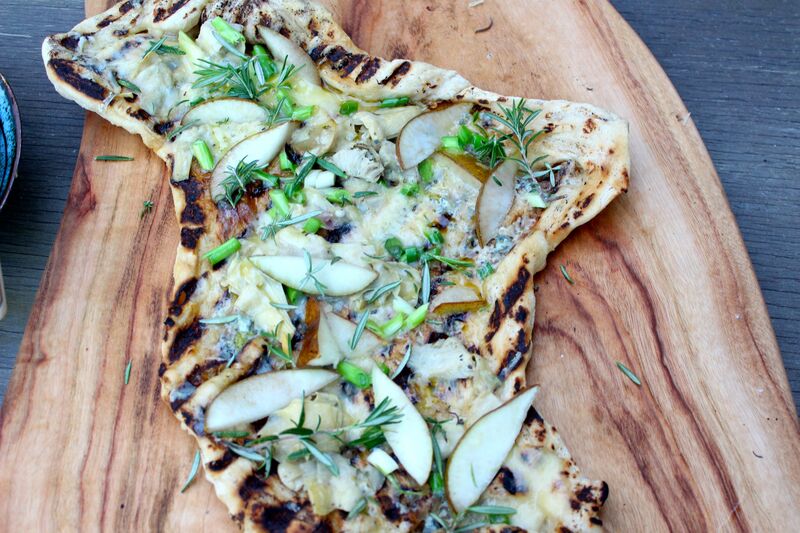 You can really heat up the barbecue very high and you get great crusty pizza. Jamie Oliver’s recipe is really straightforward and easy to follow, and it freezes really well. I tend to make a batch of dough, then divide into portions to freeze. I can then defrost and make pizza whenever I like! Here’s Jamie’s recipe, with a couple of tweaks I have made to the original. The quantity below gives you 4 small pizzas, enough for 2. Doubling the quantities gives you pizzas for 4. Pile the flour and salt on to a clean surface and make a well in the centre. Add yeast and sugar to the lukewarm water, mix up with a fork and leave for a few minutes, then pour into the well. Using a fork and a circular movement, slowly bring in the flour from the inner edge of the well and mix into the water. Continue to mix, bringing in all the flour. When the dough comes together and becomes too hard to mix with your fork, flour your hands and begin to pat it into a ball. Knead the dough by rolling it backward and forward, using one hand to stretch the dough toward you and the other hand to push the dough away from you at the same time. Repeat this for 10 minutes, until you have a smooth, springy, soft dough. Place the dough in a lightly greased bowl. Cover with plastic wrap and let double in size for about 1 hour. Divide the dough into 4 balls. Flour and cover each ball with plastic wrap, and let it rest for about 15 minutes. This will make it easier to roll it thinly. Take a piece of the dough, dust your surface and the dough with a little flour or semolina, and roll it out into a rough circle about 0.5cm thick. Tear off an appropriately sized piece of tin foil, rub it with olive oil, dust it well with flour or semolina and place the pizza base on top. Do the same with the other pieces and then, if you dust them with a little flour, you can pile them up into a stack and cover them with cling film. Preheat your barbecue till very hot (at least 250 degrees C) with the lid closed. Heat 2 baking sheets in the barbecue. Put two of the rolled-out dough rounds onto each of two baking sheets, scattering each sheet with a dusting of semolina first. At this stage you can apply your topping. Smear the tomato sauce over the base of your pizzas and spread it out to the edges. Scatter over your fillings, tearing the mozzarella into rough pieces. Drizzle with a tiny bit of extra virgin olive oil and add a pinch of salt and pepper. Put the baking sheets onto the barbecue, lid down. Cook for 7 to 10 minutes, until the pizzas are golden and crispy. Place a large non-stick frying pan on the heat and pour in a couple of generous lugs of olive oil. Add the garlic, shake the pan around a bit and, once the garlic begins to colour lightly, add the basil and the tomatoes. Using the back of a wooden spoon, mush and squash the tomatoes as much as you can. Season the sauce with salt and pepper. As soon as it comes to the boil, remove the pan from the heat. Strain the sauce through a coarse sieve into a bowl, using your wooden spoon to push any larger bits of tomato through. Discard the basil and garlic that will be left in the sieve, but make sure you scrape any of the tomatoey goodness off the back of the sieve into the bowl. Store the sauce in a clean jar in the fridge – it’ll keep for a week or so. Also great to freeze in batches , so you can defrost exactly the amount you need. Anything goes! 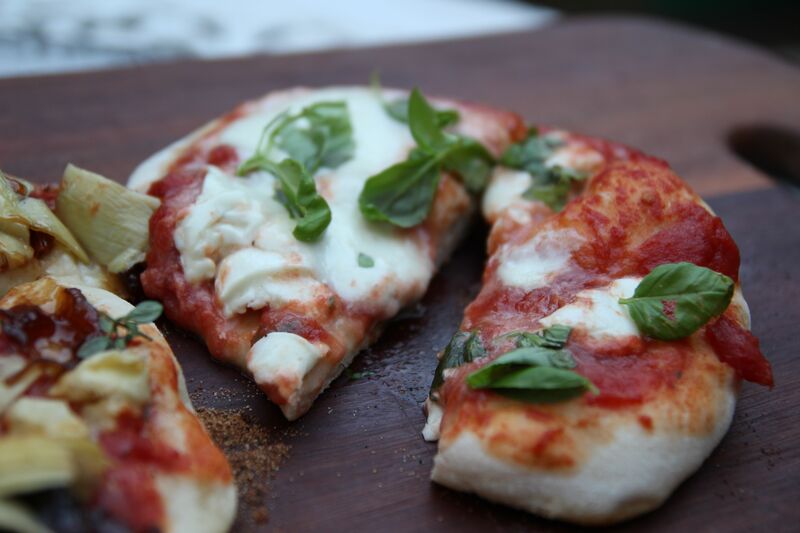 You can start your pizza off with the tomato passata, or go for a white pizza (bianca). Cheese is almost always good and mozzarella makes for a beautiful gooey pizza. Add anything you think will work! I made two tomato, mozzarella and basil pizzas, basically a pizza margherita, and for the other pizzas I added passata, artichoke heart, caramelized onion and a simple scattering of thyme leaves. Posted in Jamie Oliver, Pizza, Savoury Food and tagged barbecue, dough, passata, pizza toppings, tomatoes. Bookmark the permalink. This time I used my barbecue with a lid and a temperature gauge as the oven. 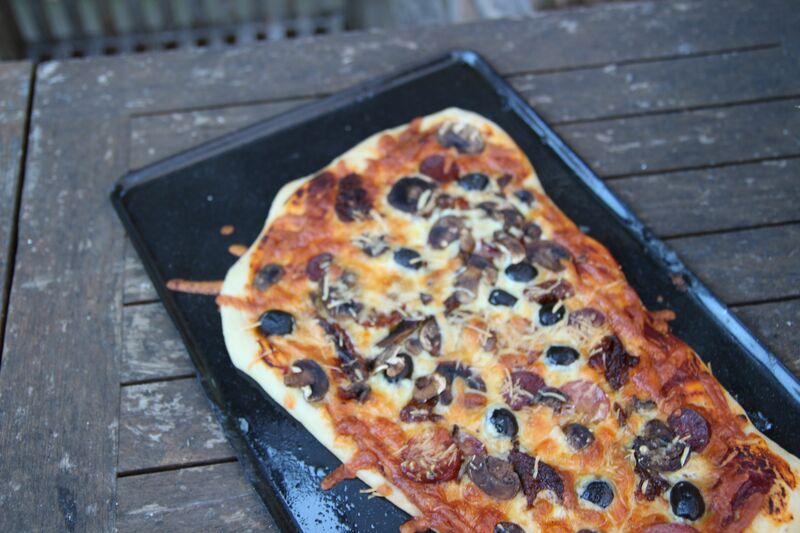 You can really heat up the barebecue very high and get great crusty pizza! I have used Jamie Oliver’s recipe – it’s really straighforward and easy to follow – with some tweaks of my own. The quantity below gives you 4 small pizzas, enough for 2. Doubling the quantities gives you pizzas for 4. 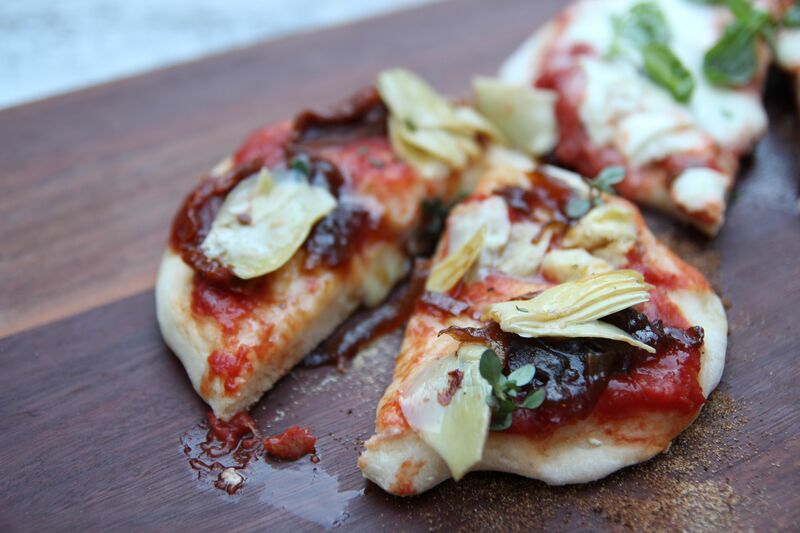 Posted in Jamie Oliver, Pizza, Reviews, Savoury Food, Vegetarian and tagged artichoke heart, barbecue, caramelized onion, Jamie Oliver, margherita pizza, pizza bianca, tinned tomatoes, tomato passata. Bookmark the permalink. 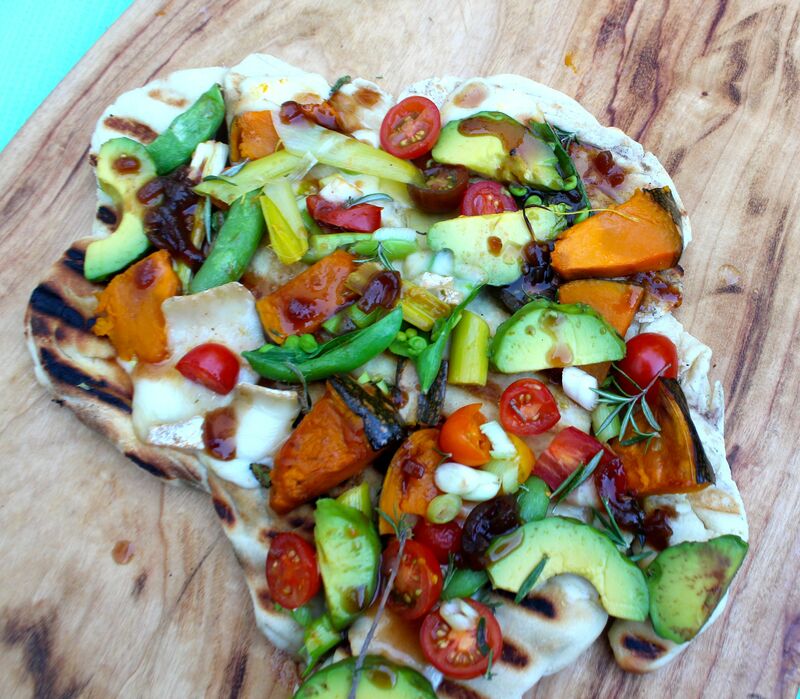 If you are a reader of this blog you would know I’m a huge fan of grilled pizza. 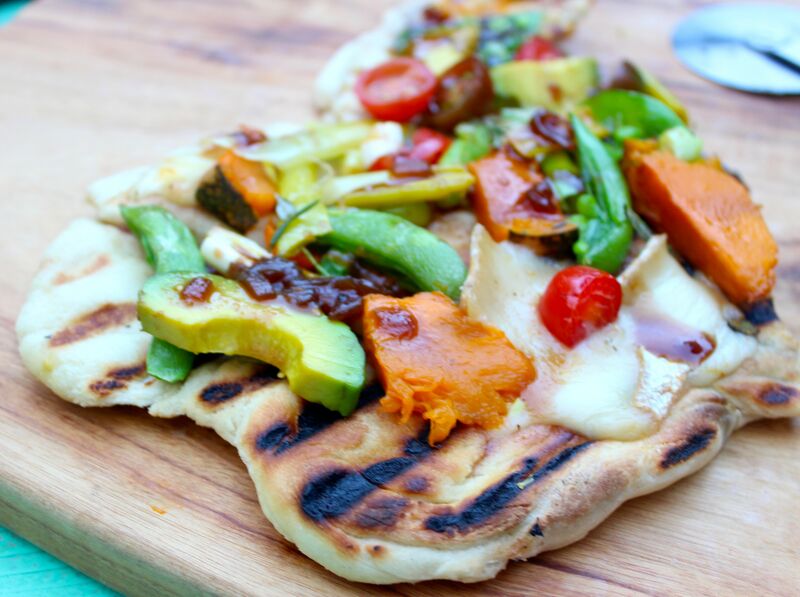 Dough cooked on the barbecue grill, then topped with flavours of your choice. There are quite a few examples here. 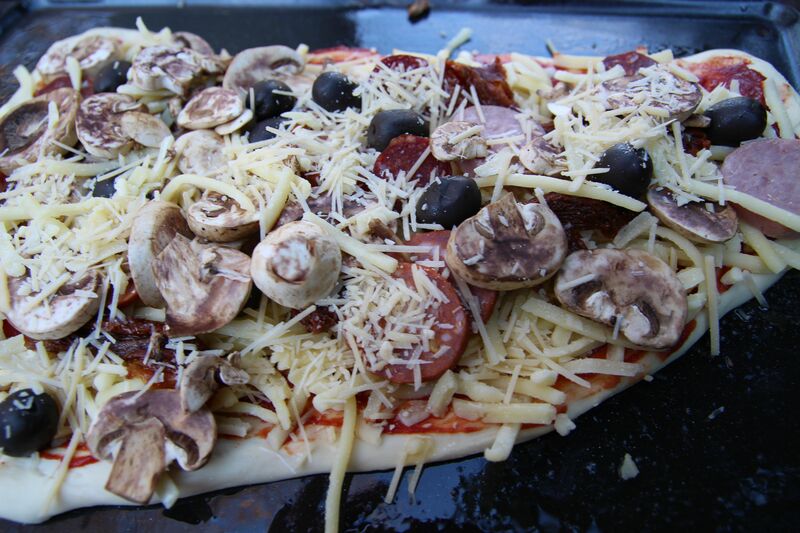 This time I decided I wanted to cook pizza the traditional way, in an oven, baking the dough + toppings all together. 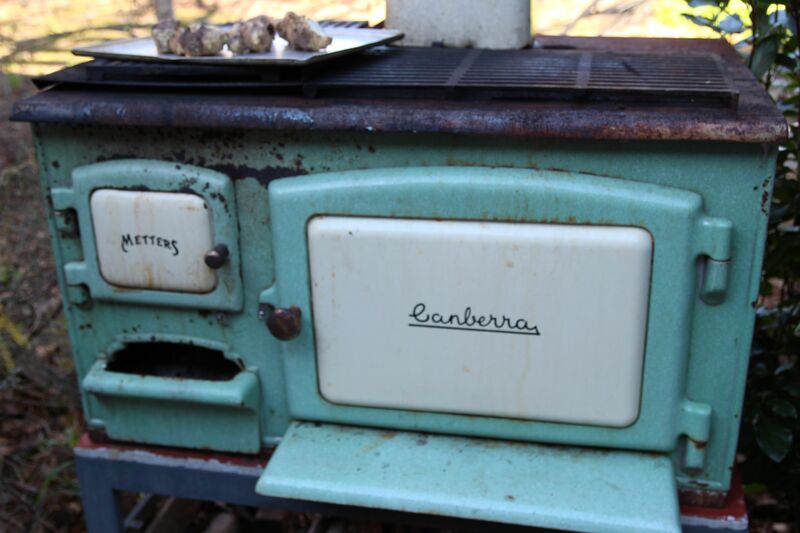 The Artisan has a wonderful old Metters “Canberra” wood fired stove, a relic of Australia’s past. It makes a fantastic garden ornament and not a bad pizza either! I made the pizza dough in Sydney on a Saturday morning, proved it, then set off for the hour and a quarter journey to Mittagong. The dough proved a second time sitting in a bowl in the car on the journey. It was then ready for shaping and topping, and into the oven which had been heating for a couple of hours. Pizzas for lunch and dough left over to make more for an appetizer that night! 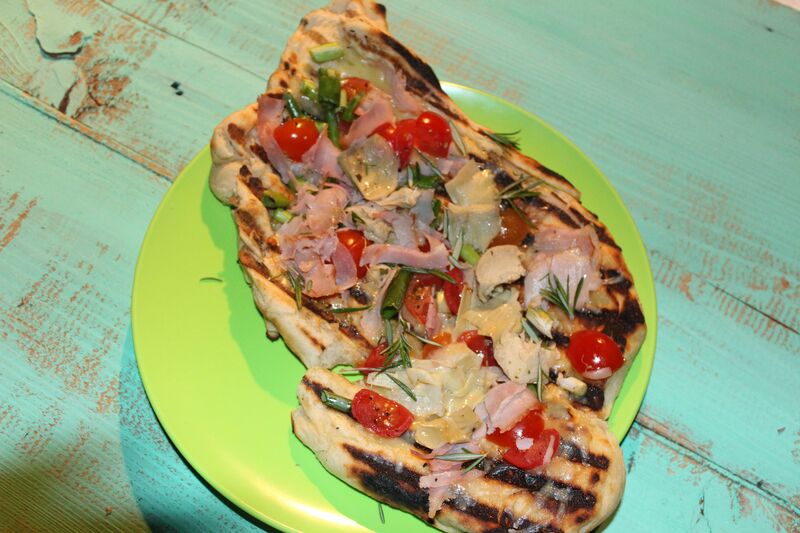 Below is the pizza dough recipe, adapted from the grilled pizza recipe. These quantities make 4 medium sized pizzas. Just add toppings of your choice. 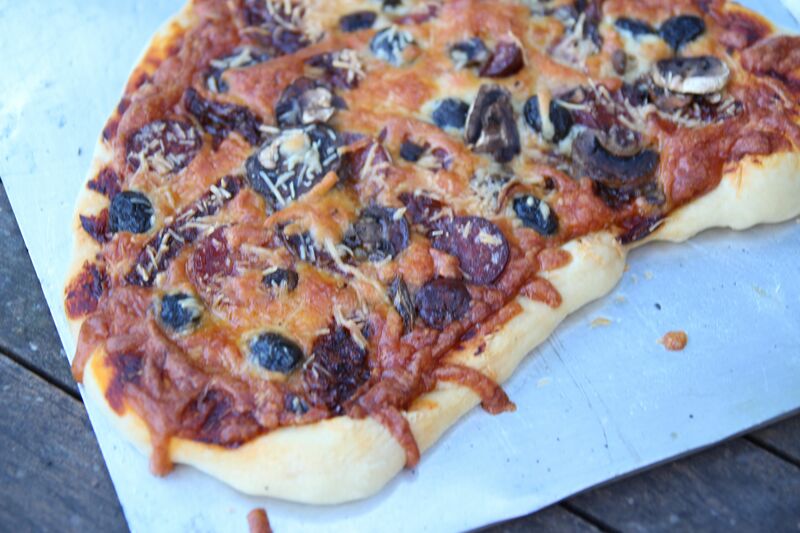 We used a tomato paste base, then added prosciutto, salami, mushrooms, black olives, grated cheddar, and maybe some other stuff! Dissolve the yeast in the warm water in a large bowl and let stand for 5 minutes. Stir in most of the flour and the salt, stirring until smooth, then the olive oil and continue adding the flour, 1 tablespoon at a time, stirring until the dough comes away from the bowl but is still sticky. Turn the dough out onto a lightly floured work surface and knead with lightly floured hands. Knead the dough until it is smooth, elastic and soft, but a little sticky, about 10 minutes. Shape the dough into a ball and transfer to a bowl lightly oiled with more extra virgin olive oil, and turn to coat. Cover with cling wrap and let rise in a warm place until it doubles in volume, about 1 1/2 – 2 hours. Punch the dough down and prepare to shape, or you can leave for an hour or two until ready to make the pizzas – the dough will prove again. Remove the dough from the bowl, divide in four and shape each into a ball. Or divide in half for 2 large pizzas. Stretch and shape the balls of dough into a rectangle or round – or any rustic shape! 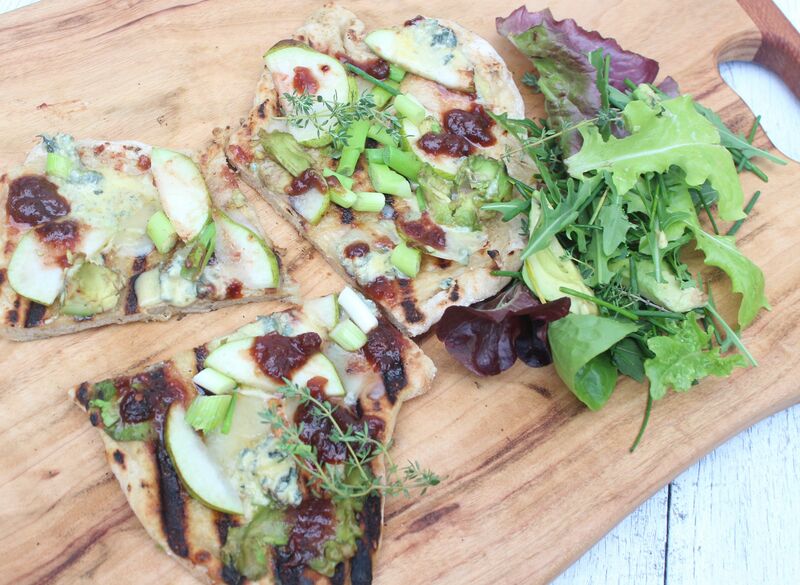 Place the pizzas on a baking tray or better still a ceramic pizza stone and apply your toppings. Let rest for 15 minutes. Bake in a hot oven until the pizzas are cooked. I leave it up to you and your oven to decide on temperature and timings. Not helpful, I know, but every oven is different! 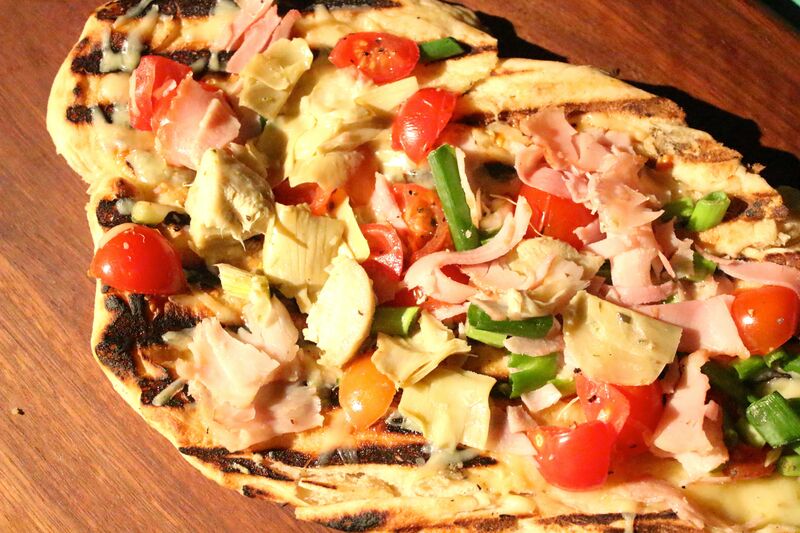 Posted in Pizza, Savoury Food and tagged Metters Canberra stove, pizza dough, pizza stone, pizza toppings, rustic fare, Southern Highlands, wood fired stove. Bookmark the permalink. 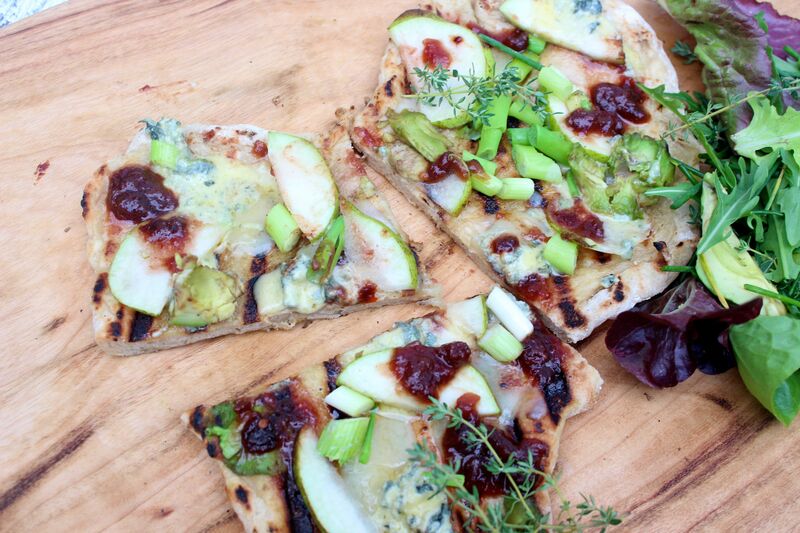 Another pizza on the grill using autumn produce. Figs were plentiful, relatively cheap in Sydney and delicious, during the Indian summer and early autumn. I added my current favourite cheese, taleggio, with walnuts. Taleggio and walnuts are a match made in heaven, in ravioli, in salads, grilled on cape seed bread and of course on pizza. The grilled pizza is my usual recipe, featured several times on this blog. 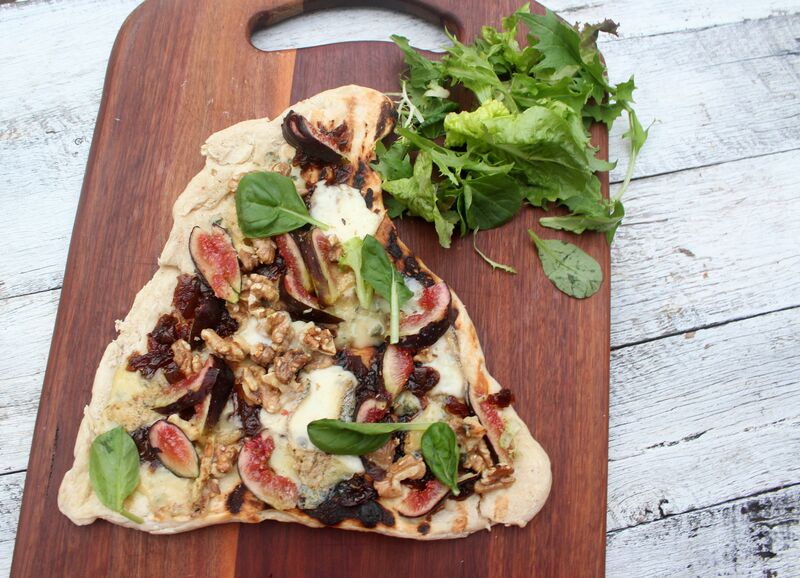 Scatter over fresh figs, taleggio cheese, chutney or sweet onion relish and walnut pieces. Serve with a scattering of greens – rocket, baby spinach or similar and fresh herbs. 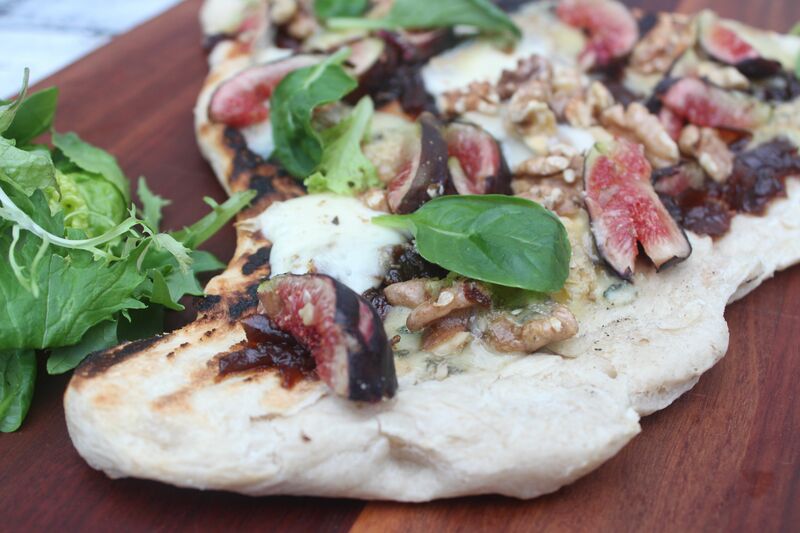 Posted in Pizza, Savoury Food and tagged barbecue, chutney, figs, taleggio, walnuts. Bookmark the permalink. 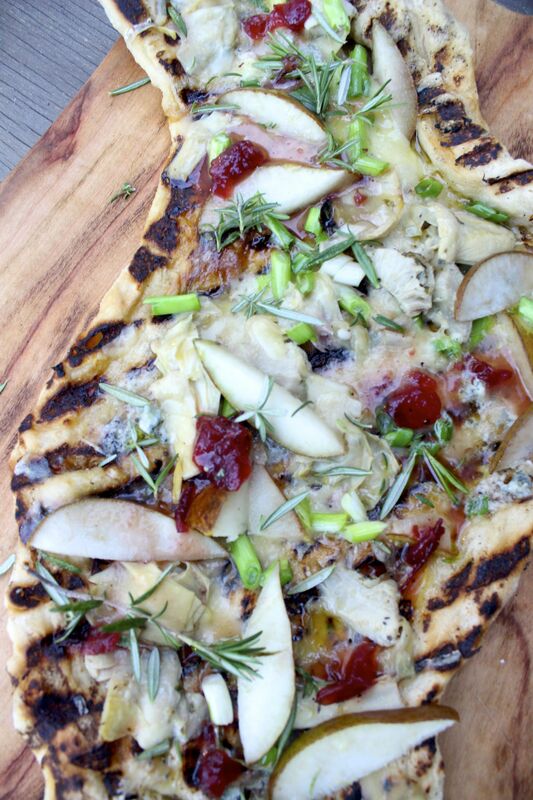 I’m revisiting Pizza on the Barbecue, one of my current cooking obsessions. 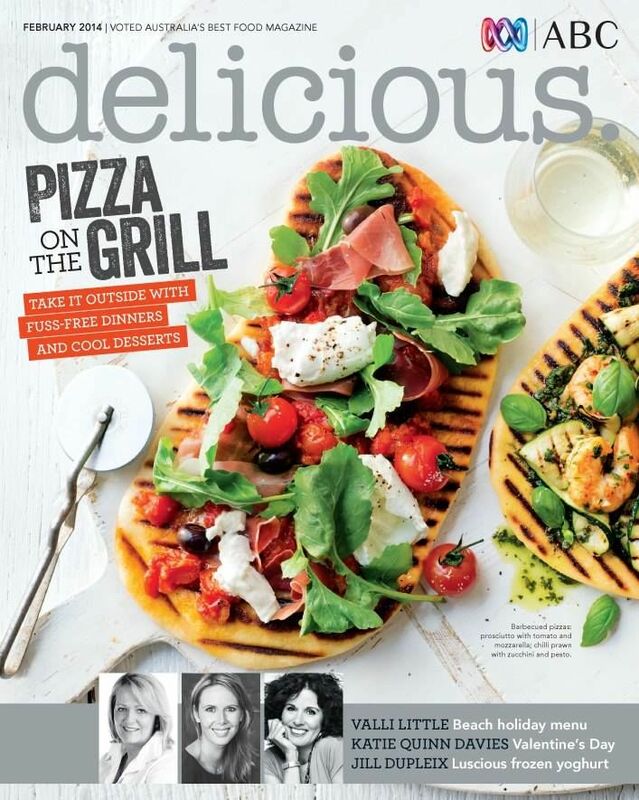 I was interested to to see that the February edition of the wonderful delicious.magazine featured Pizza on the Grill on the front cover! 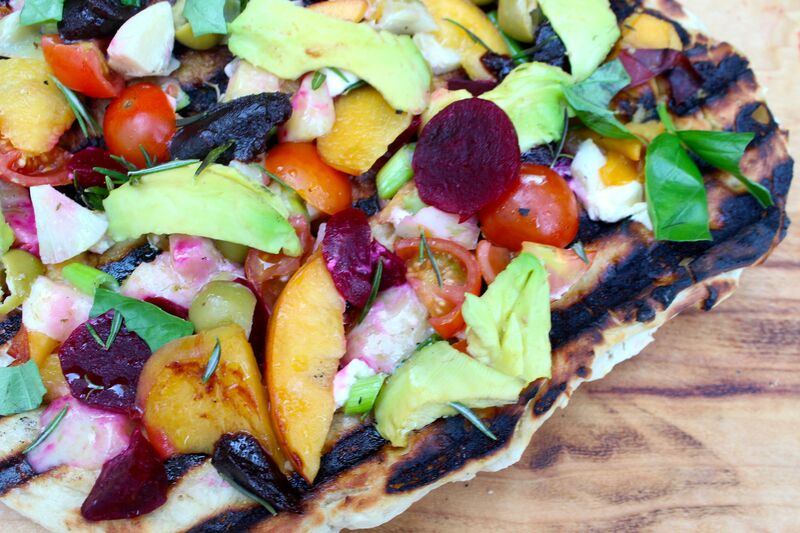 The recipes featured a similar rustic approach to grilling pizza dough on the barbecue then applying various fillings of choice. Below is the cover of delicious.magazine and the pizzas that have been featured on this blog already – plus some new variations. Posted in Pizza, Savoury Food. Bookmark the permalink. 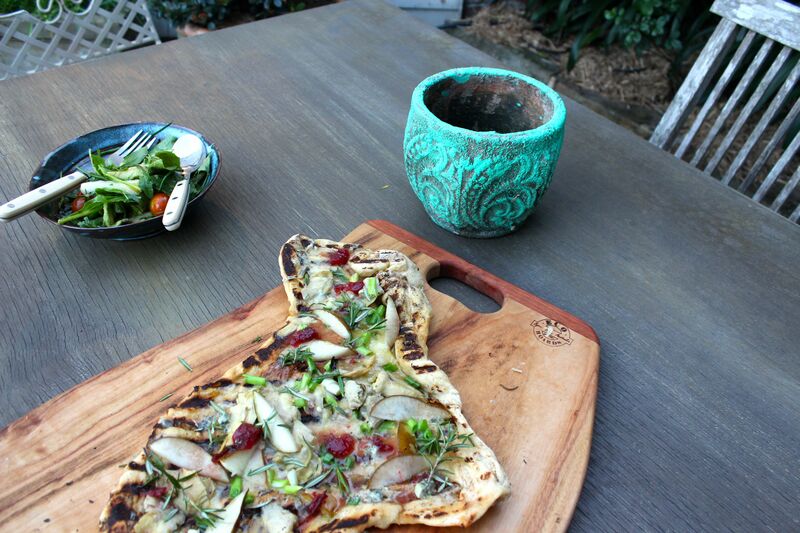 I have been really enjoying cooking grilled pizza on the barbecue. I recently posted my first efforts and am now posting a couple of variations that have worked well. One quantity of the dough recipe below makes 2 pizzas. I sometimes freeze the other pizza dough and use later for either pizza or just plain grilled flatbread, served with a little olive oil with salad or with dips. A tip – if you are freezing the dough – defrost and allow to come to room temperature but cook pretty quickly as the dough becomes soft and difficult to handle if you leave it too long. 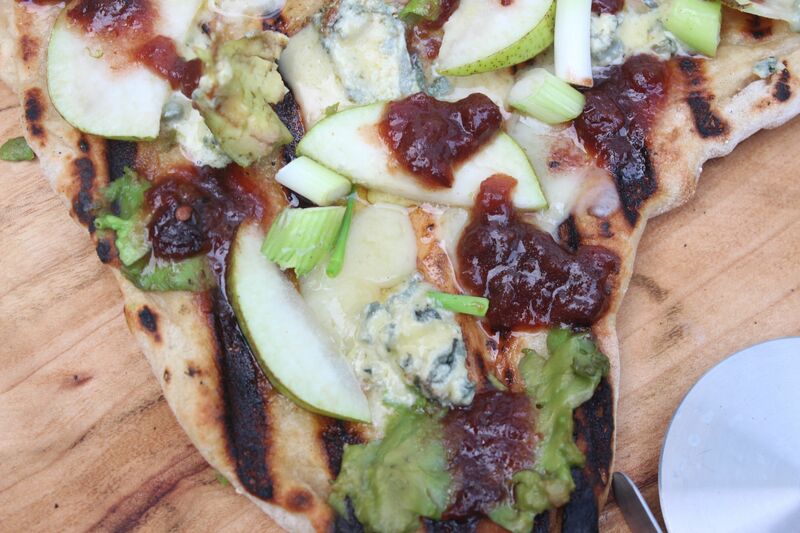 For the dressing Dressing, mix 1 tablespoon of good English fruit chutney with 1 tablespoon of red wine and a glug of extra vrigin olive oil, and spoon over the oooked pizza. 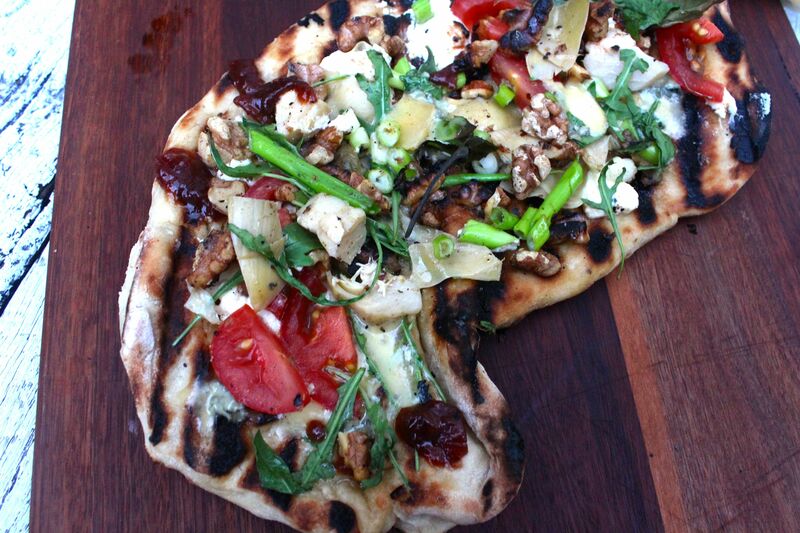 Scatter over your toppings, with the exception of the herbs. Return to the barbecue, turn down the heat to medium, close the cover and cook until the cheese has melted and the vegetables are heated through, about 5 minutes. Scatter herbs over the cooked pizza before serving. Posted in Pizza, Savoury Food and tagged artichoke hearts, avocado, basil, cherry tomatoes, Dorset Drum cheese, free range leg ham, Gippsland Blue cheese, pear, thyme. Bookmark the permalink.